28 Day Minimalism Challenge | Simplify your home in 4 weeks! 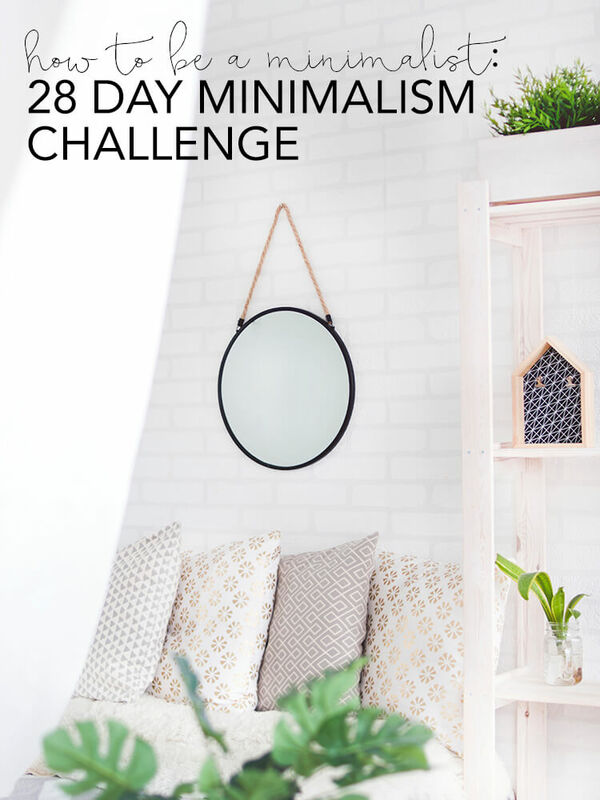 If you’re ready to simplify your lifestyle and get rid of the clutter in your home for good, this 28 day minimalism challenge is for you! It’s a no-spend challenge with daily decluttering goals to help you clean out all the main areas of your home. Together we’re going to get you on the path to simpler life! The easiest place to start your minimalism journey is with your physical belongings. It’s hard to feel calm and collected in a chaotic world when you’re surrounded by clutter and things you don’t need. So I created this 28 Day Minimalism Challenge to help you (and me) get through a lot of stuff in a relatively short amount of time. You can find more info about my challenge at #mbrminimalismchallenge. 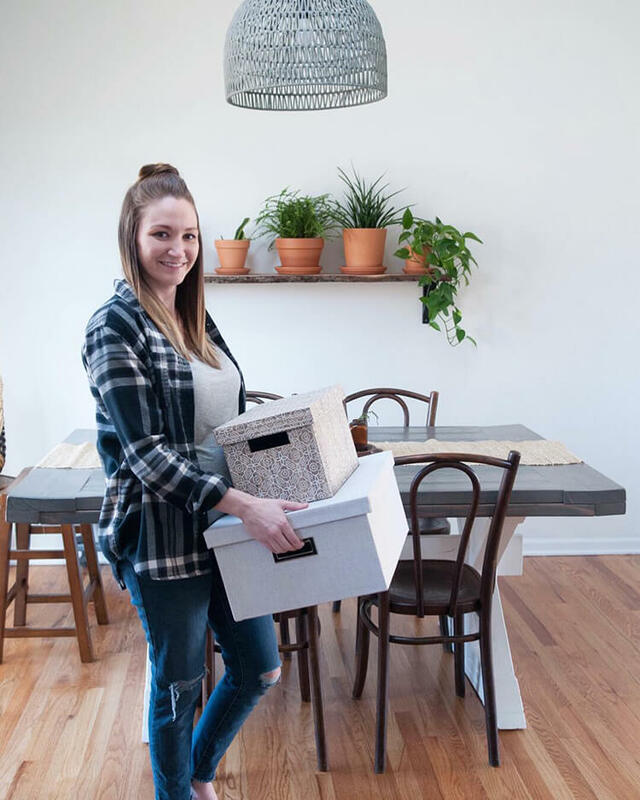 The challenge consists of 4 weeks of not buying anything but food and necessities, decluttering and organizing your home and striving to get closer to a simple lifestyle. No spending outside of food and necessities – Let’s work on controlling our impulses in the Target home decor aisles (my personal weakness). Limit eating out to 1x/week – Prioritize your time with friends and family. Either only agree to one dinner date a week or get creative and do something that doesn’t involve eating out, even if you’re preparing a meal at home with friends. Daily organizing/decluttering goals (5x per week) – These are realistic goals that reflect what was needed in my own home. Feel free to adjust them based on your individual circumstances. Here’s a list of things to get rid of if you need more ideas. I also suggest trying to sell things that you can sell quickly and easily. Don’t spend too much time doing this. Donate what doesn’t sell within 3-5 days. Here are some more reasons to donate. We will use the money you make from selling your clutter to purchase organizers in week 4. Monday: Sort clothes and decide what to keep, what to sell, and what to donate. Make plans to do these things this week so you don’t end up storing a pile of unwanted clothing for 2 years. Tuesday: Sort and donate electronics, cords, dvds, etc. Be honest about what you actually use and what you can live without. Remember, “someday” usually means “never.” If by chance you get rid of something you will need again, you can order most of these things off Amazon for a few dollars. Wednesday: Declutter your kitchen. Most of us have duplicates of things we don’t need, multiple sets of measuring cups and cookware we never use. Don’t be afraid to borrow a pan from a friend or relative if you only use it once a year. Thursday: Declutter your bathroom. Get rid of old makeup and samples you’ll never use, then clean and organize all the drawers and shelves. You may be surprised to find you can make enough space to more conveniently store things you use regularly. Monday: Clean out the pantry and work on a meal plan to use up food that’s been ignored. Tuesday: Go through all your books and sell or donate extra books. Remember friends, nearly everything is available at a library or as an ebook, so if you haven’t read it in years, considering freeing up that space in your home. Wednesday: Tackle your paper clutter. Throw away what you don’t need and file the rest. Really consider if you need to hold on to certain documents, most bills and official documents are available online. Thursday: Pick a closet to clean out. You’ve already cleared out clothes, but this is an opportunity to go through a utility closet or all that home decor you have stashed away. Here are my best tips for how to organize your closet. Friday: Repurpose something fun! Make some home decor with supplies you have on hand. This geometric planter DIY is a great example of something I might have trashed but was able to give new life. Monday: Pick another closet or cabinet to clean out. Some places to consider are a kid’s closet, your laundry room, basement storage, etc. Tuesday: Clear out all the junk drawers. Everything in those drawers should have a dedicated spot in your home. If there isn’t one, decide where it should go. If you don’t use it or don’t know what it is, pitch it. Wednesday: Take care of a small home project that’s been ignored. This might be hanging out decor that’s been laying around or something similar. Thursday: Clean up email and unsubscribe from junk mail. Digital clutter matters, and it’s really hard to stick to a spending freeze when you get notifications about every sale you’re missing out on. Friday: Take a trip to the recycling center to turn in household items you can’t put in the trash like glass, paint, etc. Monday: Purchase closet organizers with money from sold clutter – or gather up what you already have. The reason we decluttered first is so we could avoid organizing things we should get rid of and can more accurately assess the bins, etc we need. 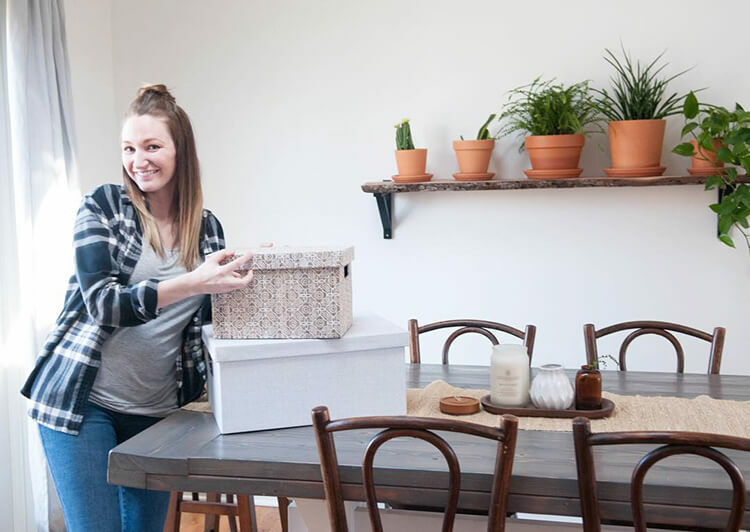 You can find some of my favorite storage bins from Amazon here. Tuesday: Organize cleaning products. Separate items into different caddies by room they’re used in. Wednesday: Organize bedroom closets with bins, etc. Categorize like items and label your bins so everything is easy to find. Thursday: Pick a place in your home that still needs some attention. Does your garage need cleaning or does your yard need some work? Friday: Make a list of things you want to purchase after the spending freeze is over and areas of your home you can still make a difference in. Make a plan to be intentional with purchases and use what you’ve learned during this challenge to continue your minimalism journey. Print out the 28 Day Minimalism Challenge schedule to help you stay on track. Sign up for my email list here and it will be sent directly to your inbox! It’s so easy to fall into old habits or overindulge once the challenge is over, so really work on being intentional during the 28 days. Organize things in ways you think you’ll be able to maintain and adjust as needed. Use the 4 week spending freeze as a chance to evaluate what you items you really need in your home. Identify what you can live without that you previously thought you needed. Hopefully after 4 weeks, you’ve realized life goes on when you pass up impulse purchases. I found my “busyness” was immediately reduced when I wasn’t making up errands to run for unnecessary items. I had plenty of time to think about some bigger purchases we needed to make for our home. When I finally bought them I was confident I was spending money the way I wanted to. Make a plan to reorganize your spaces on a regular basis. It’s a good idea to plan to clean out closets once or twice a year. Come up with similar schedules for the areas in your home that tend to accumulate storage or clutter. This 28 day minimalism challenge is 4 weeks of hard work, but the payoff is well worth it! If you decide to participate, please tag me on Facebook and Instagram and use the hashtag #mbrminimalismchallenge so I can cheer you on! If you liked this minimalism challenge post, pin it!